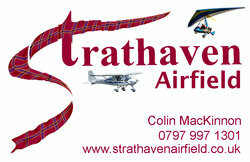 If you are thinking about buying an aircraft, the first port of call for most pilots is www.afors.com - incidentally, run by Strathaven-based pilot Alex Paterson! Typical hangarage rates in 2016 were £185 per month for a fully-rigged aircraft and £125 a month for one with wings folded. There is also a £250 a year club membership to use the airfield, which covers landing fees, internet, use of the clubhouse etc.